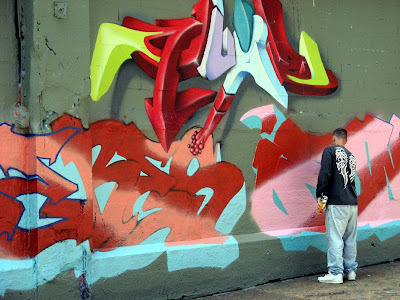 I am celebrating Ruby Tuesday today with photos from 5POINTZ, a warehouse space dedicated to the work of graffiti artists in Queens, New York City. Artists may work here for free with impunity. The RED skies caught my eye. The green figure in front may be a nymph. What do you think? ifONE is the artist in the photo who gave me permission to post his work. His REDs are brilliant. I was surprised not to find more RED than I did. Don't forget to come back and sign Mr. Linky after you post to your own blog. WoooHooo!!! I'm first. Got a couple of Ruby Red Corvettes for you. 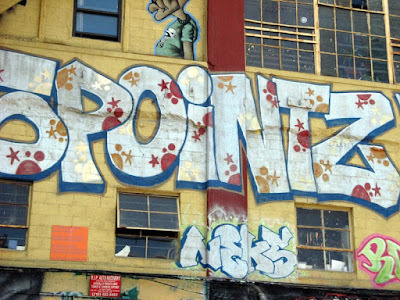 I'm not a big fan of where graffiti ends up, but I do like the art form. Excellent choices. I like iFonE's work best. The green figure looks like a fairy to me. Now there is some real talent! In Singapore, artists that flaunt their work out in the streets are slap with a fuge 5k Fine. Not first this week, but still enjoyable. Lots of red in nature, but I see lots of red in many urban areas as well. Yours post shows a very this urban art in the larger than life big city. As Carletta notes, not my style but what art agrees with all of its viewers? I know someone who is going to like this post. I am glad to see they have a legal wall to paint. I love that graffiti art. Very interesting choice for Ruby Tuesday. I like how ifONE's art looks so dimensional. It's beautiful. I bet it was fun to photograph. I have a new food blog and I'm putting a link to both it and my askew to you blog today. I hope that it alright. If it's not, I can do one or the other next week. I love that there's a place for all that creativity to have free expression. Wonderful photos. What happens when they run out of wall? Do they pain over it? Your new banner photo is gorgeous. Wonderful..I wish there were more places for some of these frustrated artists to paint.. My second Ruby Tuesday contribution is up..
Those are great! 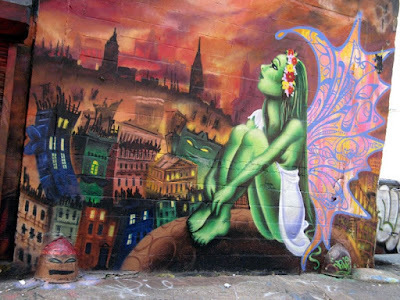 Some graffiti murals are just so amazing!! What an incredible variety of reds in your pics Mary! Just brilliant! Nice art! I have Ruby Red Fords and a Waffle Bus. They're not Corvettes, but we like them. Check it out! And thanks for letting me play! Sorry all, but my entire URL was not in my first link. I guess I had a Brain Freeze. The second link should work. Some great art work there. It's good these guys are getting a place to do it. This graffiti is very well executed. What a great place for this kind of art! Graffiti van be very beautiful I think! I'm joining in for the second time this week, and it's up now! What a lovely series of RED works of art! HRT! Mary, these are just wonderful! The only graffiti I seem to find is vulgar. Wow...I think I may just have to visit there....that is awesome! How cool, Mary! I think the green creature is a fairy :o) Have a great Tuesday! As promisssed, I made a RED creation with lots of RED, I made its Red myself, just have look. Wow, what a great post. These graffiti artests are so tallented. My husband and I are train fans, and much of this talent is wasted on the sides of box cars. If someone provided a place for them to express paint more folks could enjoy what they do. I think she's a nymphette ;-) Or a magical fairy. Great artwork you captured. Like Carletta, I think it's art when in the right place. I'm number 33! and that's our street address. These artists always amaze me with what they can do. Happy Ruby Tuesday. Hi guys Thanks for the great comments and posts (I've been around to a couple of people). I'll be around to everyone by day's end! Great Ruby Tuesday! Wow Mary! How cool to be able to hang out there and see them work. Love the artwork! And the bug is ruby too... AND alien! I think the cityscape is fantastic and while scrolling down for comments I found the space alien doodle!!! Love the doodle too. All this is really cool !! I have a Ruby Tuesday post up today!! Great photos Mary, whimsical and fun! I have my Ruby Tuesday post up now. Looking forward to reading as many others as I can! these are great shots of street art. 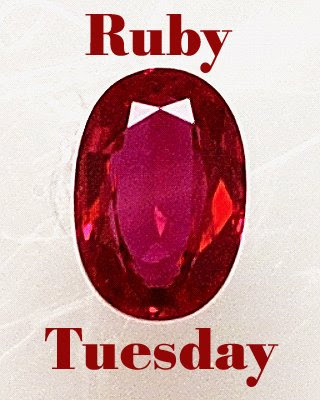 Hi Mary - I've been seeing the Ruby Tuesday meme for a little while now, and it looks like a lot of fun, so I've decided to join. My first Ruby Tuesday post is a Princess Michiko Hibiscus blossom. Is there somewhere I should sign up (other than your Mr. Linky on this post)? And please tell me where to link back to. I put the small Ruby Tuesday badge on the post, but so far it does not link to anything. Tink posted a comment saying I could put up my entry for Ruby Tuesday. Thanks to her, so I am here. You have a wonderful collection of Reds. Oh man, I keep forgetting about joining Ruby Tuesday! I need to start looking out for red. Great graffiti shots! Very cool stuff! I don't like the defacing of property, but there's no question that graffiti is an art. Interesting! Very beautiful work of art. Mine is up!